Charleston County Environmental Management offers recycling service for residents living in apartments and condominiums. Participating communities agree to designate an area for recycling containers on their property, in or next to their garbage enclosure area or in parking spaces close to garbage dumpsters. Recycling containers are serviced on a weekly basis. Please distribute these educational flyers to your residents. 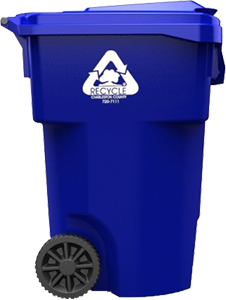 Participating in the County's multi-family recycling program may enable you to reduce the size of your disposal dumpster and/or the number of collection pickups which can potentially save you money! For details, contact Charleston County Environmental Management. Charleston County Environmental Management provides assistance to help property managers start and maintain a successful recycling program at their community. Staff is available to perform a free on-site waste assessment to assist with equipment placement, answer questions, and provide educational materials for community staff to distribute to residents. Priorities of renters are changing. 86% of renters prefer to live a green community with eco-friendly options such as the ability to recycle. Offering this service can make your community more marketable to future tenants. If you have any additional questions or would like to schedule a free on-site waste assessment, contact Charleston County Environmental Management at (843)720-7111. Making the effort to recycle takes little to no time out of your day and impacts our environment in a positive way. Recycling is easy! Just remember to place your recyclable material in a recycling container rather than a garbage container. These recycling tote bags (shown below) are available to residents living in an apartment or a condominium. Use the tote to collect recyclables inside and then transfer the material to recycling carts or dumpsters located outside at a designated area. 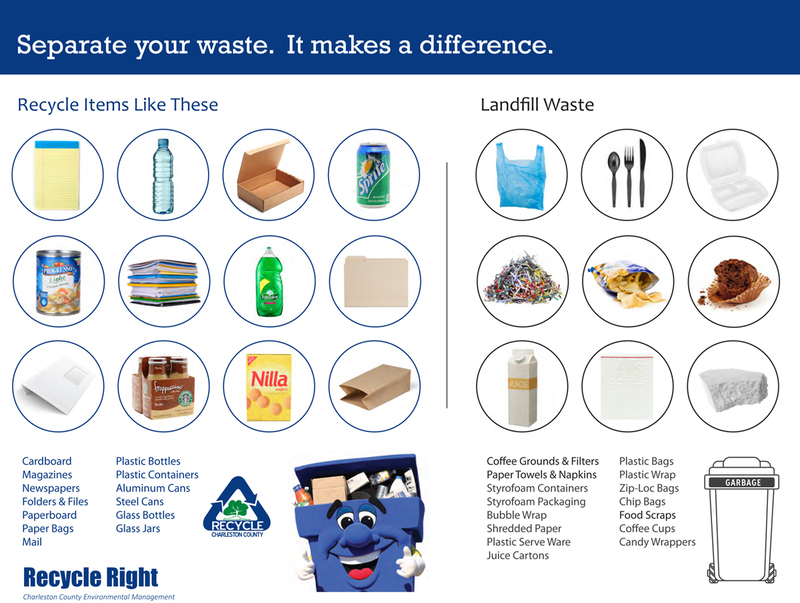 If you would like to start recycling at your apartment or multi-family complex, ask your property manager to contact the Charleston County Environmental Management Department at (843)720-7111 for more information. 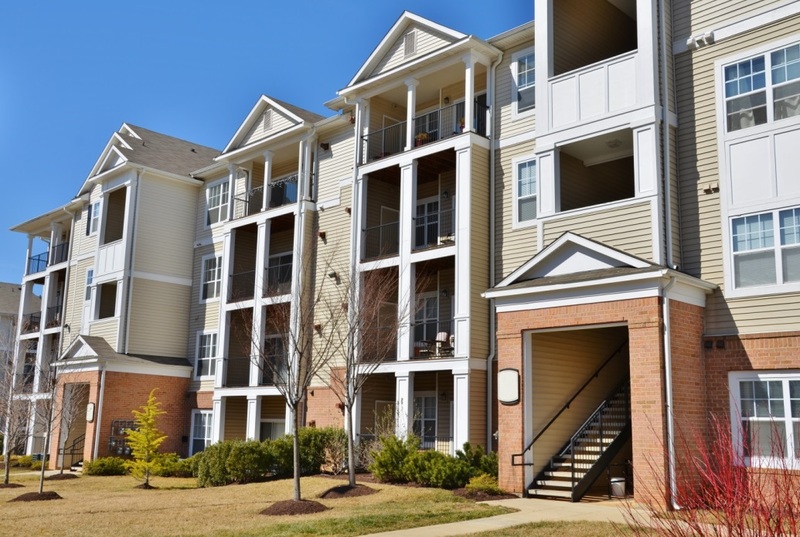 Q: How do I know if my community qualifies as "multi-family"? A: Sometimes it is difficult to determine which program a community is better suited for, Charleston County's multi-family recycling program or the County's single family residential recycling program. Typically if a community has shared garbage dumpsters, they will also need shared recycling containers and therefore qualify for the County's multi-family recycling program. Q: What are the space requirements for the recycling containers? A: Charleston County offers multi-family communities two types of containers to collect recyclables. Roll carts have a 95 gallon capacity and are 45" tall, 29" wide, and 34" deep. The number of roll carts that your community needs will be determined by participation rates. 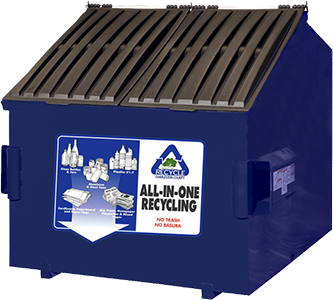 Charleston County offers 8yd, 6yd, and 4yd dumpster style containers as an option for larger complexes participating in the multi-family recycling program. These dumpsters require a vertical clearance of 22 feet. A: Payment of the Solid Waste User Fee, included as part of your annual Property Tax Bill, funds programs and services that include weekly recycling collection. Q: What items are accepted? A: Paper products accepted include: magazines, books (including paperbacks, textbooks & hardbacks), junk mail, magazines, catalogs, envelopes, newspaper, office paper, greeting cards, wrapping paper, coupons, posters, sticky notes, file folders, shoe boxes, paper egg cartons, paperboard (such as cereal boxes), and corrugated cardboard. Containers accepted include: plastics bottles and containers, including water bottles, soda bottles, milk jugs, liquid containers, jars and tubs (yogurt, margarine tubs, etc. ), detergent and all-purpose cleaner bottles, soap and shampoo bottles, rigid plastic product packaging, such as clean rigid clamshell containers, and plastic cups, aluminum cans & baking pans, clean aluminum foil, steel & tin cans (including empty aerosol cans), and glass jars & bottles. Q: What items are NOT accepted? A: Styrofoam (cups, egg cartons, take-out containers), plastic bags, shredded paper, plastic film & packaging, food waste, yard waste, pet waste, diapers, fabric, clothing, textiles, clothes hangers, garden hoses, syringes, large metal items (such as frying pans and metal pipes), and large plastic items (such as Big Wheels or other children's toys). Other items include: household hazardous waste and toxic household products, electronics, batteries, light bulbs, tires, motor oil, cooking oil, and paint. 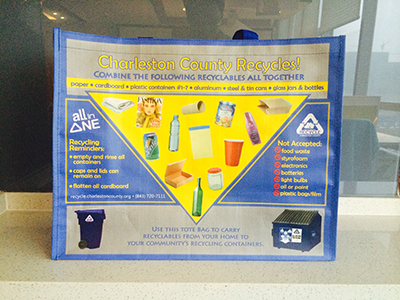 These items can be recycled at one of Charleston County's 8 staffed convenience centers. Click here for location details and contact information. Q: What should I do with my household hazardous waste and electronic waste? A: Household hazardous waste, motor oil, cooking oil, paint, batteries, light bulbs, tires and electronics may be taken to one of Charleston County's 9 convenience centers. Click here for location details and contact information. Q: How do I get a recycling container to use inside my apartment/condo? A: Designing your own interior recycling container is easy. Be creative! Residents are encouraged to reuse paper grocery bags to store recyclable paper products. A plastic storage bin or tub can be used for plastic, glass, aluminum and steel containers. Q: What should I do with bulky items like furniture? A: Contact your local municipality to inquire about bulky waste. Consider donating unwanted items to charity organizations. Q: What should I do with my plastic grocery bags? A: Return clean plastic bags to the grocery store. Other options include reusing plastic bags as trash can liners or as pet litter bags when walking your pet.